The New York Times best-selling author of The Winter People and Promise Not to Tell returns with a riveting psychological thriller in which an unresolved murder haunts a family for generations, forcing one daughter into a life of hiding and concealed identity to escape a deadly threat. On a brilliantly sunny summer afternoon, ten-year-old Miles Sandeski witnesses the murder of his mother as she sunbathes in their suburban backyard. When he emerges from a hidden play space to disrupt the crime, Miles scares off the killer, but he is left with a powerful clue that will compel him to pursue the murderer and seek an understanding of the horrifying event for decades. Years later, secretly aware of the killer's identity and what he is after, Miles will try to protect his teenage daughter from becoming the next victim--the murderer wants something, held within Miles' family in the small industrial New England town of Ashton, and will fatally pursue each generation for what's desired. Burntown unfolds as the story of Miles's daughter when she emerges from an incident intended to kill her, with a loss of memory and a total dislocation from the life she has known. Necco, as she comes to be known, embarks on a life as a kind of fugitive, hiding as an outsider in the town's abandoned corners Ashton's underbelly, Burntown reliant on kind strangers for her survival: a boyfriend who is himself a run-away, the mystical women known as "the fire eaters" who give her shelter in a camp by the river, practicing sooth and seeing through the altered reality of powerful herbs they call "The Devil's Snuff," Theo, a high-school senior who finds herself caught up in a romantic affair that compels her to sell drugs to students and teachers at Our Lady of Hope high school, and Pru, the cafeteria lady there, Theo's best customer, who dreams of being beautiful, talented, and adored in another life. The lives of these misfits lost teens and adults intersect in a crime that implicates them all, and as they flee the police and the real killer who continues to hunt Necco, a story unfurls that is edge-of-your-seat suspenseful with classic Jennifer McMahon twists and surprises." "You never know. My mama always said it's the people no one notices who are most full of surprises". But she understands now that if you open a door, anything might come through. From the author of Winter People and The Night Sister, comes yet another multi-generational, intricately woven thriller/murder mystery with subtle supernatural undertones and remarkably rich cast of characters. 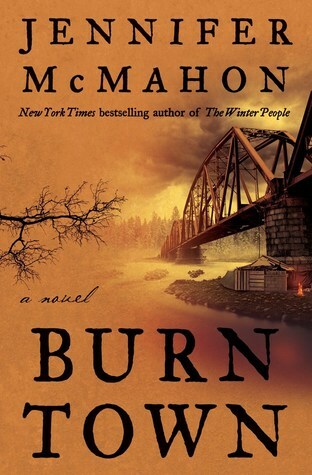 Burntown is different from Jennifer's two previous novels, in both the atmosphere and overall tone of the book (it's less creepy, but somehow more unsettling and emotionally affecting). I'd definitely say it's less Stephen King, and more Dean Koontz, if you know what I mean. And let me tell you, guys, Jennifer has been on my auto-buy list for a while now, and every time I pick up her new book, I am reminded exactly why that is. She's just so good at twisty, edge-of-the-seat thrillers that have a beating heart at the core of it all. And while Burntown isn't my favorite of her books (I'd say Winter People takes the podium there), it is definitely a well-plotted, fast- paced page-turner that is very much worth your while. At first, the vibe I got from this book was more sinister and reminiscent of Frequency (the 2000's movie), but as the story unraveled, and new characters were introduced, I realized this was more of a deftly plotted murder mystery, than a ghastly, bone-chilling thriller. And that's not a bad thing at all, as I found myself really hooked on the story line, trying to guess ahead and solve the puzzle (which wasn't easy at all, let me tell you that). I must admit that I felt rather teased by the fantasy/supernatural aspect of the plot. I was hoping that part would be explored further (as in, the special phone would play a bigger part). The way the plot unraveled left me craving more. Initially, I assumed the lost (or stolen, if you will) Edison's secret invention that allows you to communicate with the dead would be at the core of the story, and we would eventually get to see it in action again, in some super creeptastic, hair-raising scene. Well, that didn't happen. Aside from the two brief scene-setters that took place in the past and were the catalysts to the events centering Eva in the present, the supernatural aspect came down to the Fire Breathers and their ability to see beyond the veil after using the Snuff. That being said, I thoroughly enjoyed putting pieces of the puzzle together and figuring out who-dunit. Some parts of the story were a bit predictable, while others left me genuinely surprised and pleased. I must also add, that I really connected with the characters in this story, especially Eva and Theo. I appreciated how diverse the cast was, too. I loved Pru and her little circus full of dreams and magic. And I loved the (very, very subtle and barely present, yet thoroughly satisfying) romance between Pru and Fred. It was a nice little cherry to top off the captivating read.